Our Morningside hair salon highly recommends using color safe products for your color-treated hair. Strong shampoos that are not formulated for color-treated hair can cause even the best hair color to fade, but a color-preserving shampoo and conditioner can enhance your hair color or highlights. Many color safe shampoos and conditioners, particularly those that are geared toward a certain shade of hair color, will contain special formulas and color enhancers to protect your hair color and slow down the color fading process. Hair color consists of tiny molecules. When you first receive a hair color service, a hair color formula is applied to your hair that will open the hair cuticle allowing the hair color molecules to enter the hair and be deposited. Once the hair coloring process is complete, the color is rinsed out with cool water, the cuticle closes back to keep the color molecules in the hair. In order to preserve the longevity of your hair color, the cuticle of the hair needs to stay closed tokeep the color molecules intact. Heat styling as well as harsh shampoos and styling products can cause the hair cuticle to open and can strip the color molecules from your hair. Color safe shampoos and products are designed with a special formula that keeps the hair cuticle from being opened. In addition to a good, color safe shampoo and conditioner, use hair care daily products that contain sunscreens and light oils. Keep your hair thoroughly moisturized and protein conditioned! Regular conditioning goes a long way toward preserving hair color and keeping the hair radiant with little product! 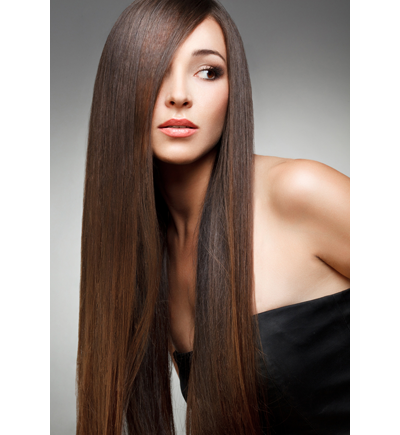 Our Morningside hair salon can recommend several shampoos and conditioners formulated for color-treated hair. 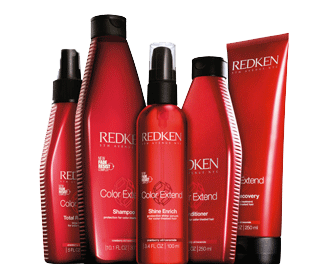 Redken's Color Extend line is especially helpful. Color Extend has a "fade resist complex" formula that contains ceramides to strengthen color-treated hair, UV filters to defend against fading from the sun, cranberry oil to maximize color vibrancy, plus shine-enhancing silicon. Haircolor looks vibrant and radiant with mirror-like shine. Not washing your hair everyday will not only help preserve your hair color, it will also make your hair less dry and add more shine. If possible, shampoo your hair no more than three or four times a week. When you do shampoo your hair, make sure to rinse it in cool water, not steaming hot. Cool water will help close the hair cuticle, which will help your hair color last longer. If your hair gets oily easily, use a dry shampoo on days you skip a normal shampoo. Just as the sun can fade fabric, drapery, and other items, the sun can also fade your hair color. If you plan to be in the sun, our Morningside hair salon suggests that you wear a hat to protect your hair color from UV rays and sun damage. Avoid going outdoors with damp hair. The sun can be especially damaging to hair color on damp or wet hair that is exposed to harsh sunlight. Do you have other questions related to hair color or hair care? Ask one of the hair color specialists at our Morningside hair salon!